So to start off this month’s post, let’s briefly look at the subtle differences between two different categories of art. This will enable two things: a) for us to be on the same “page” when it comes to discussing artworks on paper (Please, PLEASE forgive the awful puns in this post!) and (b) for you to impress all your friends with your insightful knowledge of the art world. Drawing: any work using “dry” media (eg, charcoal, pencil, chalk or pastel) – the one exception here being the “wet” media of pen/brush and ink – usually executed on paper, although some artists continually push this limit to include drawings on canvas. Painting: any work executed using “wet” media, including mixed media wherein any combination of oil paint, acrylic paint, charcoal, encaustic, etc. 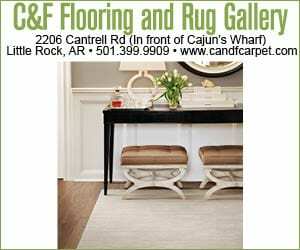 A painting can be done on paper, canvas, board, or any surface capable of sustaining the pigments safely over time. The distinction here is that a “drawing” can quickly morph into becoming a “painting” by simply including a liquid to suspend the pigment on the surface. Envision this as an example………. picture an artist sketching with charcoal on paper. Then suddenly he reaches for a paint brush, dips it into water and begins to “paint” by smudging the charcoal around the paper with the wet brush, thus moving from drawing into painting. Again, the scholars out there may be screaming inside right now, and that’s ok. But as an active artist, I’ll tell you that this is often the line of distinction for me personally. This is how I engage my own art process. And it is with this viewpoint that I regard the work of others – whether I’m scouting pieces for clients or simply admiring them in a gallery. It’s funny – many people consider European, Old-World oil paintings (often, specifically oil and not acrylic!) to be the quintessential piece of “art”. That’s fine. They can think that way. It’s also funny that many contemporary “painters” out there today are blurring the lines (again, with the shameless puns. Whew!!!) between painting and drawing. Take for instance the artist Scott Ingram. He would probably be considered a painter, first and foremost. 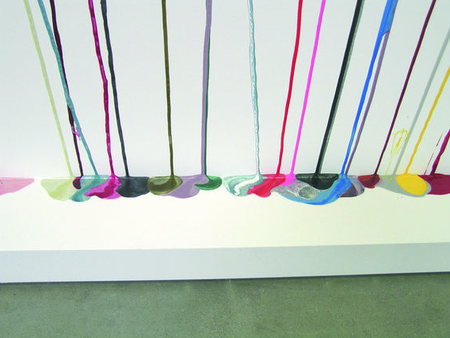 But recently he has used nail polish, an atypical medium, and the pull of gravity to make his mark. Check out his process…. Notice how designer Suzanne Kasler infuses this highly-traditional room setting with new life by selecting her color palette based on a Scott Ingram piece on paper. It’s truly delightful! 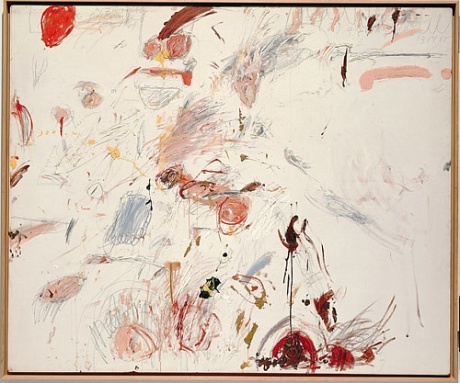 Another artist who blurred the lines of drawing and painting is the late Cy Twombly, whose pieces are at once childlike and intimate, cryptic and profound. Such a wonderful composition, artwork with furnishings. Great mix. 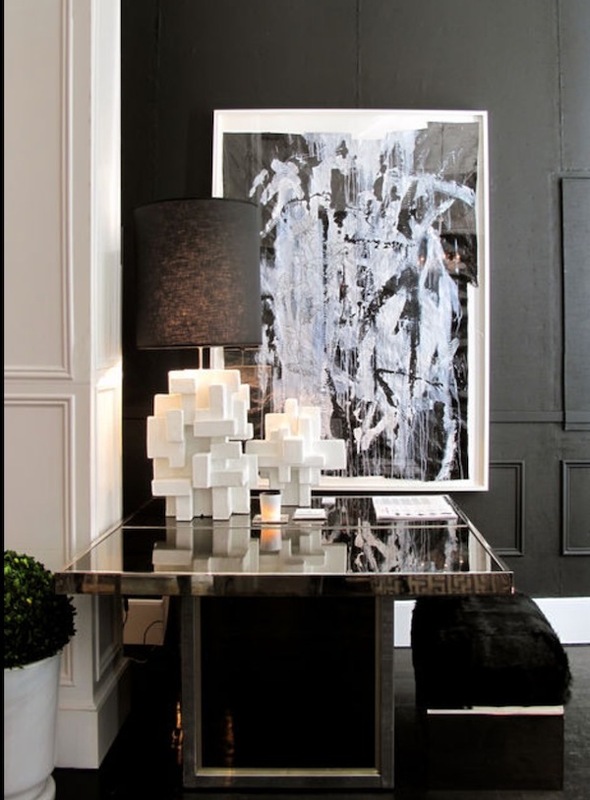 And here, notice how this monolithic-scaled work on paper presides over this living room setting. The piece is both serene and fragile. There is something very familiar and childlike about being face-to-face with artwork on paper. And it’s true, there is something immediate and human about a fragile piece of paper, especially considering that a work on canvas may last centuries longer. 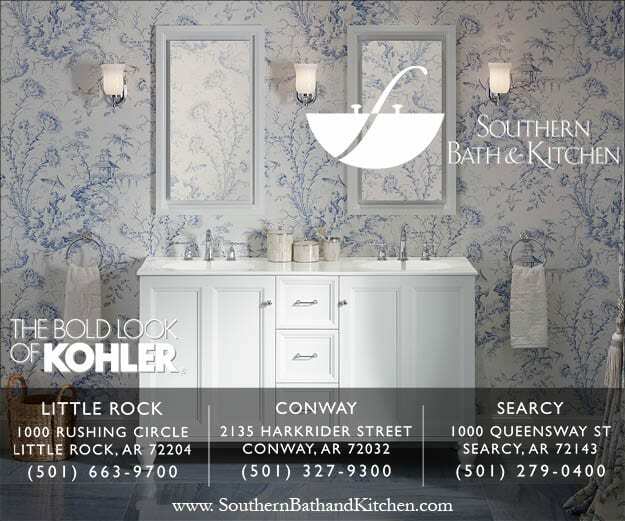 Little Rock’s own Arts Center is devoted to works on paper. Did you know that? 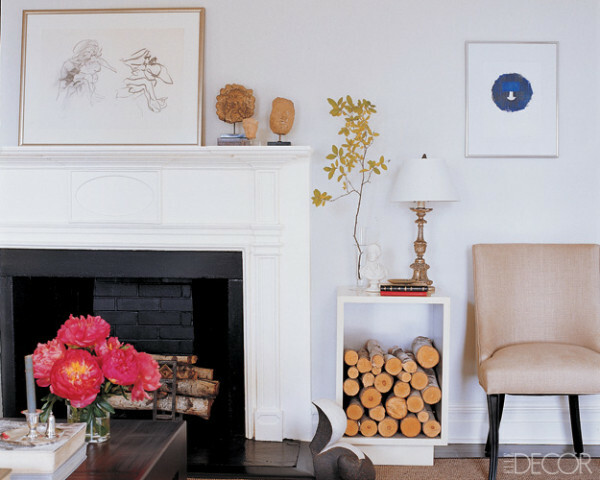 Notice how placing a drawing on paper above this mantle provides an air of simple elegance and approachability. 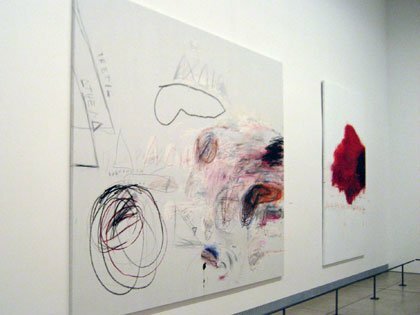 Well, there’s some brilliant art discourse for your day. Hopefully you’re totally in tune with your inner artist by now. Now go grab a pencil or paintbrush and make a doodle, or a sketch, or a painting even. And above the all, learn to value artworks on paper. They’re really so cool. Cheers! Let’s talk paper. No, not the towel or tissue variety. Artwork on paper. I have a special love for works on paper and over the next few months we will journey together and learn all about etchings, lithographs, mixed media works, as well as the tricky differences between, say, drawings and paintings. We will dive into what it means to collect works on paper, having them framed and living with this type of medium in your home. Doesn’t all that just sound so interesting?? It’s so fun you can’t stand it, right? RIGHT? Well, keep reading anyway and at least you’ll be able to impress someone at a party with terms like “gouache” and “assemblage”. (No – those aren’t references to food.) Who knows, you might even have a little fun. 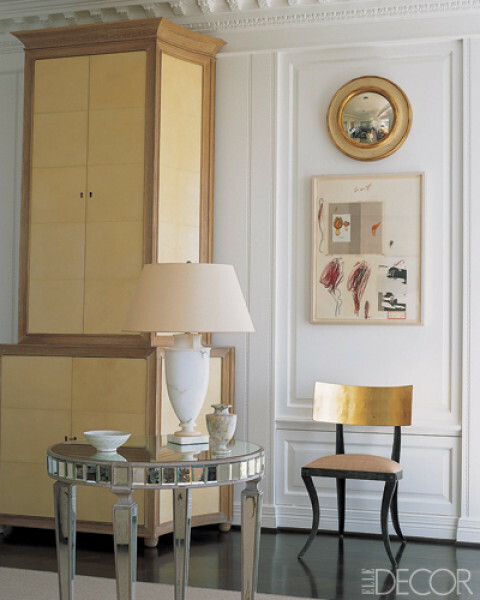 And then you can go crazy filling your home with chic art. So until next month, here are some appetite-whetting images of ultra chic interiors with a wonderful assortment of artworks on paper…. 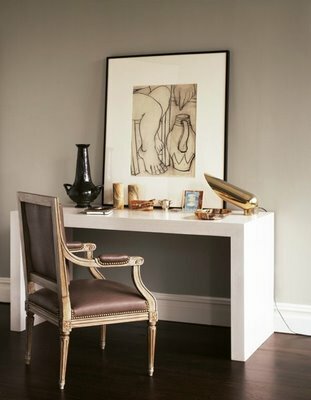 I love this vignette – the pairing of antique European chair and hard-edged, clean-lined console table, mixed with Old World sketch framed behind glass. All the eclecticism makes this little story feel very updated. Technically, some historians and art critics assign photography into a category all its own, but in this case we will include it. 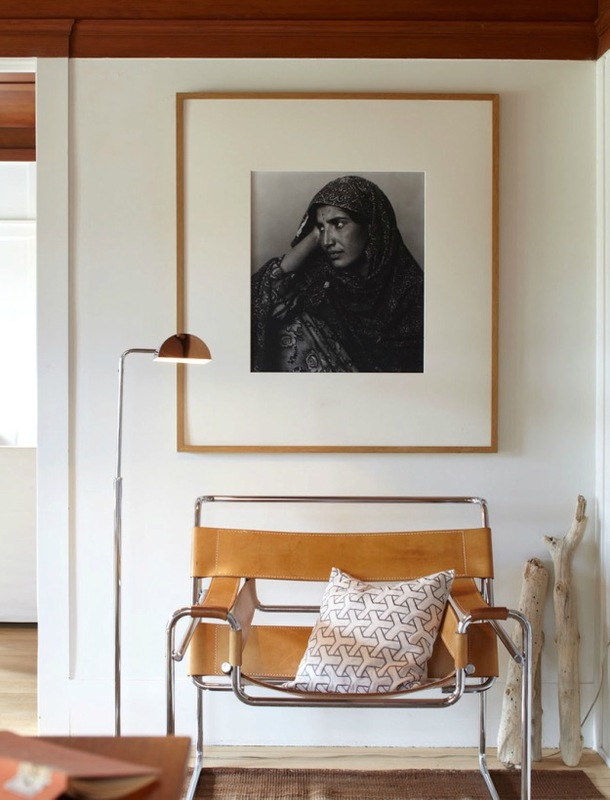 Plus, there is something quite special about this Wassily chair, in all its warm caramel/honey leather glory, that plays so nicely alongside the vintage floor lamp and the photographic work framed in a similarly warm toned frame. 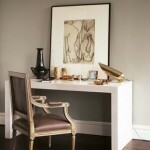 This is the epitome of neutral modern-masculine chic. 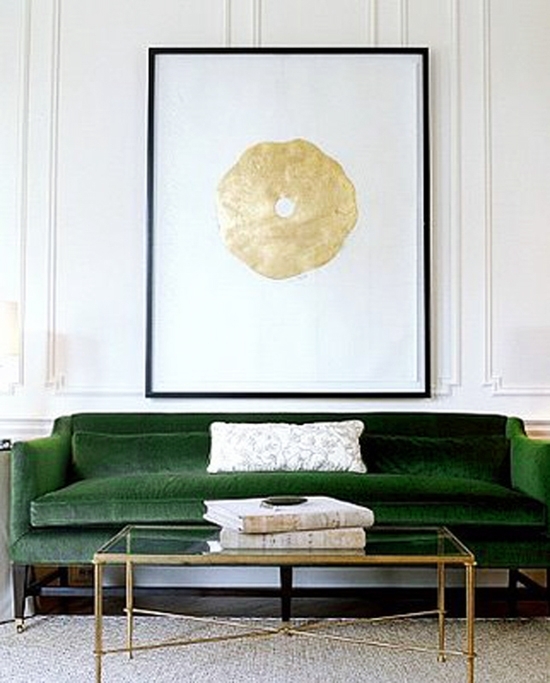 And lastly for today, this elegant pairing of emerald velvet settee and monolithic-scaled gold leaf work is right up my alley. Green and gold together like this takes me to my happy place. Mmmmmmmm. The artwork is framed very simply – clean black frame, float-mounted behind glass – and yet it presides very strikingly over this room, almost like a sun disc. Very glam. (We’ll learn more about specific framing techniques soon). So for now, go find a place in your home that might be calling out for some artwork on paper! I’ll teach you how to select and buy it in our next post. Cheers!